Moto Guzzi National Owners Club - Handlebars on a Rossa? Well, I guess that nothing is sacred in our garage changes to, most anything can happen. When Barbara bought her Rosso Mandello she was very happy with the bike but she was some what splayed out over the gas tank in order to reach the clip-ons. I have applied handlebars to several different bikes that were not intended to have handle bars and the results have always been favorable. So, now I was eyeballing the Rosso with a desire to undress the front end. I mentioned my idea of applying bars to our friend Marty McAlister. Marty has a Bridgeport milling machine and can fabricate just about anything. I was going to drill the upper triple damp and mount risers to accommodate the bars... very simple. This was all bar-talk and I really had not pursued anything. Just before Christmas Marty told me that he was almost finished but that it would probably be the second week in January before he could get the triple damp to us. I was really surprised. Marty said that since the bike was a numbered Series that we shouldn't drill the stock part and besides he could make one. 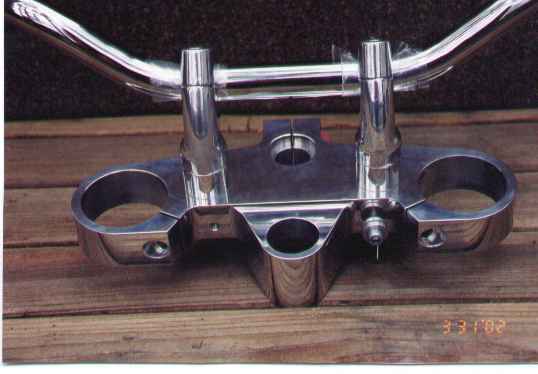 Sure enough he brought over the upper triple clamp and it is a representation of metallic beauty. This is not the first sort of odd item that Marty has made for us, he is really talented and a Guzzi rider to boot, and also a great friend. I'll mow his yard any day. I found some Yamaha Virago risers and I used Bike Master European Sport Touring handlebars. The combination of the two brings the rider's hand position up and back about four inches. All the wiring and the brake and clutch lines reached. The brake line had to be rerouted, but that was about it. Barbara no longer looks as if she is going to climb over the tank and she is much more comfortable. I have since purchased a 2000 V11 Sport and I took the upper triple over to Marty's. We drilled the bosses so that I could mount the bars. We didn't deem it necessary to fabricate another upper triple damp for this bike since it wasn't a numbered series... just a weird color of yellow and green. I was unable to locate another set of Virago risers, so I used a pair off of a Suzuki 400, but I did use the same style handle bars as we used on the Rosso. There is about 1 1/2 inches difference in the positioning of the bars on the two bikes with the Rosso being the further back from the rider. I have included a photo that we took of Barbara's triple damp and I hope it prints well. It is really pretty. Barbara contemplated wearing it as a piece of jewelry, but decided she would rather mount it on the bike. Marty McAlister, in Durham, North Carolina, can fabricate anything from engine parts to frame bits so should anyone need anything give him a call at: 919-620-5819.